This special edition of Strangled 1 contains all 3 stories from the original STRANGLED tape and the revised version. Lots of extras plus never before seen footage of Tina Krause! This special edition of Strangled 1 contains all 3 stories from the original STRANGLED tape and the revised version. “Car Trouble“, which was the original segment, stars Dawn Murphy and Deana Enoches as two hapless motorists who go to the wrong house for help and end up the prisoners of a psychotic killer! This story was replaced for reasons too involved to go into here with the “Secret Agent Murders” starring Tina Krause, Dawn Murphy, and Deana Enoches. Tina and Dawn are two secret agents who learn a deadly secret about their boss and are targeted for murder. But in order to throw suspicion away from himself, he has his associate make it look like the work of the serial killer, the stocking strangler. Clancey McCauley makes an appearance as an innocent victim who dies as a red herring to make the scenario even more believable. Deana plays Dawn’s sister and she comes after the killers for revenge. In “George’s Daydreams“, Ben Morgan plays George, a guy who plans to murder three women after they humiliate him at a bar. He goes after each one, strangling two of them, and drowning the third. 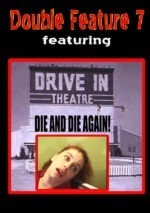 Starring Tina Krause, Dawn Murphy, Deana Enoches. “George’s Daydreams” appeared in both versions of the STRANGLED tape, but with one difference. Deana’s strangling scene was replaced with a different one. For the first time, you’ll get to see both scenes on the same tape. AND … see some of our sexiest shower footage yet featuring Deana in “George’s Daydreams” and Tina in “The Secret Agent Murders”. PLUS … as an extra added bonus, you’ll see Tina Krause’s uncensored strangling scene from “Secret Agent Murders“.